Few things elicit squeals of glee as successfully as mention of a "new Zelda" game. Thus, simply by showing off a few scenes and announcing a title for the game, Nintendo managed to score a success from their appearance at E3 2010, above and beyond announcing a new DS, a new Metroid and scores of other exciting games. Skyward Sword, the new Zelda title, is a return to the taller, darker and handsomer Link from Twilight Princess, but this time the game has been designed for the ground up to use the Wii; specifically, the Wii Motion Plus. Twilight Princess, if you'll recall, had begun development prior to the announcement of the Wii, and was originally intended as a Gamecube title. The Wii version of the game, while very good, was little more than a port. Movement controls existed, but weren't fantastic and at times detracted form what was a wonderfully original game experience. With Skyward Sword, Nintendo has set out to correct these problems. Utilizing the enhanced motion control of the Wii Motion Plus, Skyward Sword allows players to control not only when Link swings his sword, but in what direction. You can even hold the Wii Remote in front of you, as it if were a sword, and Link will do the same. Every motion of the Wii Remote is translated into a motion of the sword, allowing for various types and strengths of attacks. If an enemy is guarding his sides, swing the Wii Remote downward, and Link will attack in the same manner, bypassing the enemy's defenses. If he's defending his head, swing the Wii Remote from side-to-side, and Link will slash across the enemy's body. You can also jab, and Link will do the same. As with most of Nintendo's hardware or software enhancements, this seems at first like a minor improvement, but when taken in context of the branching list of possibilities the motion control presents, is enormous. In addition to the new sword moves, Link can now, using the same motion control, throw, place or roll bombs, depending on how you move the Wii Remote. His special attacks are also triggered, not by button presses, but by meaningful gestures. Considering Link's usual compliment of weapons and gadgets, one can easily imagine the gameplay possibilities. 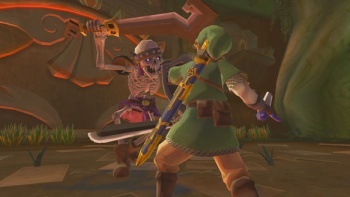 Aside from the new controls, Nintendo didn't reveal much about Skyward Sword in their E3 demo. The demo was created using a unique art style the Nintendo rep called "a watercolor effect," which to me just looked like unfinished art. If it was intentional, though, assuming it gets some more love between now and when the game is released, it could present yet another new look for the series, which, considering its current home on the graphics-poor Wii, could definitely use it. Story-wise, we have absolutely no news. I can't even tell you what "skyward sword" refers to, other than the obvious reference to the enhanced motion controls. Internet rumors suggest that this new installment features a Link born in a land above the clouds, but let's hold off getting all woody over that until the official release. What we do know is that the gameplay is going to be fun. And that there will probably be a princess to save, Triforces to collect and a boss enemy named Ganon. And that it will be one of the few must-have titles for the Wii when it's released, some time next year.